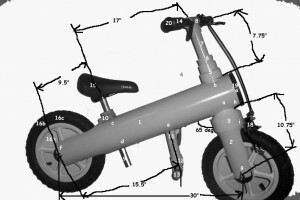 Knowing that the key to the design of a Balance bike is enabling balance, I based my first glider prototype on the same geometry as a downhill mountain bike now our (Patented Slow speed geometry) *, which has a lower center of gravity to give the rider increased stability and a slower balancing speed. My first balance bike model was handmade out of PVC in my backyard in the suburbs of Boston, while there was still snow on the ground. Since that first prototype learning bike, I perfected the design, making minor adjustments to the steering angle and seat height, and began to manufacture Glide Bikes by hand in my workshop in Wilmington, NC, where I moved in 2005. 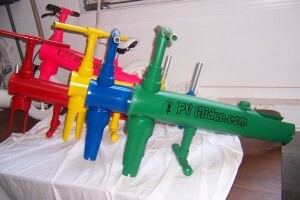 I was proud to be the only Balance bike designed and manufactured in the United States. All of these features come together to form the perfect balance bike. Children and parents alike will love the safe design of our Glide Bikes, which allows riders to simply place their feet down should they need to stop, or balance. Due to the low balancing speed and lightweight design of the balance bike, the child can easily control it without the assistance of a parent. Our newest balance bike, the Super Glider, was specifically designed for older children with special needs and adults who have never ridden a bike before. Featuring a larger frame, adjustable seat, and a pedal system that can be added, the Super Glider is the perfect solution for anybody who wants to learn how to ride a bike safely and easily. We now hold a US utility patent an over 6 year endeavor. *Downhill Mountain Bike Geometry (65° seat and head tube angles) is designed to give the bike the slowest balancing speed possible. Regular Mountain Bike Geometry is 68-69° seat and head tube angle. Road Bike Geometry is 70-71° seat and head tube angle.